Added on 12 July 2018 . By Mariah Posey. Whether you're Jewish or looking for a beautiful and delicious dining experience, Tish should serve all of your needs. 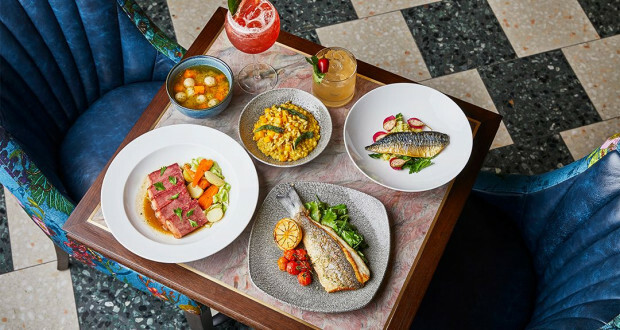 Set to open in Belsize Park, the restaurant will be offering an all-day menu of European cuisine and Jewish heritage favourites. Tish's luxurious seating and alfresco terrace make it ideal for dining and small plates throughout the day. Diners can look forward to appetising dairy-free selections such as Challah French toast, seared salmon fillet with green kale salsa, and crispy duck leg. On-the-go guests can enjoy lighter dishes like salads and quick-serve sandwiches and have cocktails or Kosher wines previously unavailable in the UK to wash it all down. For dessert, tasty treats like bramley apple strudel and panna cotta will be served. You'll have all day indulge as the site stays open from 7am til past midnight.